Halloween is my favourite time of the year. As a lover of all things alternative, Halloween means I can wear the things I normally like to wear without standing out too much. If it has a skull on it, I want it! But anyway, one of my favourite things is that I get to do some Halloween nail art. First I put on a base coat, where I used the Revlon Quick Dry Base Coat. Then, I did two coats of Models Own Coconut Cream to give me an opaque white base. I made sure I gave this half an hour to dry so I wouldn't smudge it when I went to draw on the spider webs. 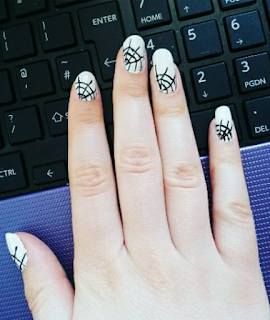 To draw the spider webs, I used the BarryM Black Nail Art Pen. I find this is the easiest way to do this as it is just like a pen. however a striper (a thinner nail brush) can do the same job. I start off by drawing 3 semi 'circles' with three straight lines. I then use the little corners of the edges of the lines to determine where the lines of the web are going to go through. I do 3 of these. It is really difficult to explain in words, so it is easier to just look at the photo. When using black on white it is SO important that you let it dry completely before applying a top coat. Otherwise, you will smudge the black into the white and ruin your design! To avoid this I actually did these nails at night time and went to sleep afterwards so the black had all night to fully dry and then I did the top coat when I woke up. I understand this may not be possible for everyone, but I really cannot stress enough how important it is to let the black completely dry. That's it! Spider webs are my favourite design to do at Halloween as it is easy to do and because it is only made up of lines it is easier to do on the other hand where you need to use your non-dominant hand to draw them. 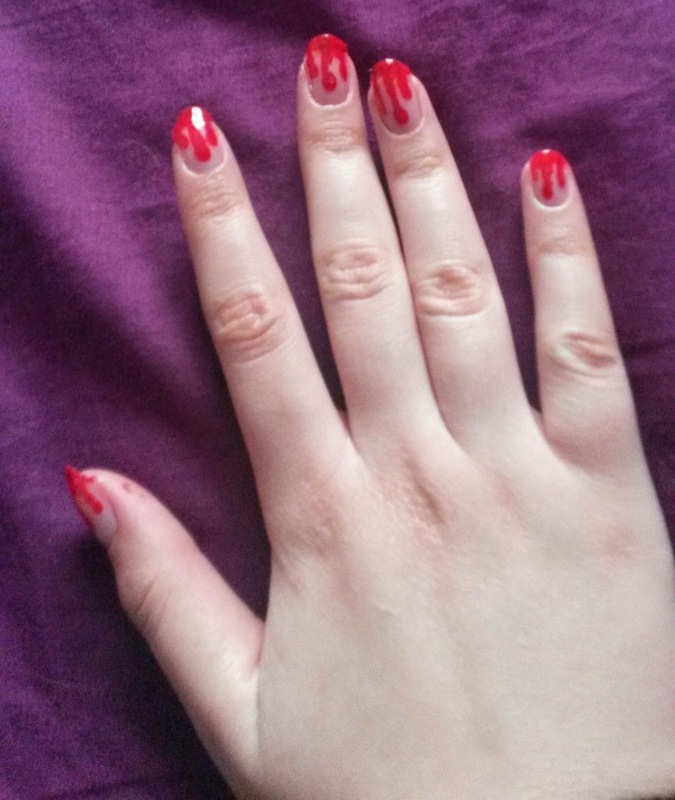 What have you done on your nails for Halloween? Let me know! I thought I would share with you a post I made last year at Halloween. Last year I did some dripping blood nail art which I thought were really cool and they actually received a lot of compliments. If you'd like to see how to do it, click here. Are you doing anything for Halloween? I absolutely love the idea of Halloween but I never get to do anything. I love the designs, the clothes and the general spooky-ness. Plus the great YouTube tutorials of different make up designs! 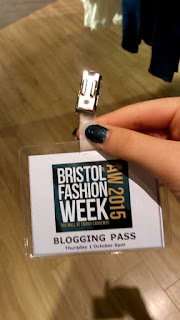 This post has been long time coming because soon after Bristol Fashion Week, I got ill! I had an eye infection in both eyes, a throat infection and trouble with my ears so I was dosed up on a lot of antibiotics and painkillers. Thankfully I've only got the eye infections left to get rid of now, but that explains why I've been away from the blog for so long! But anyway, this year I was invited to Bristol Fashion Week along with other local bloggers to view what is in fashion for Autumn/Winter. 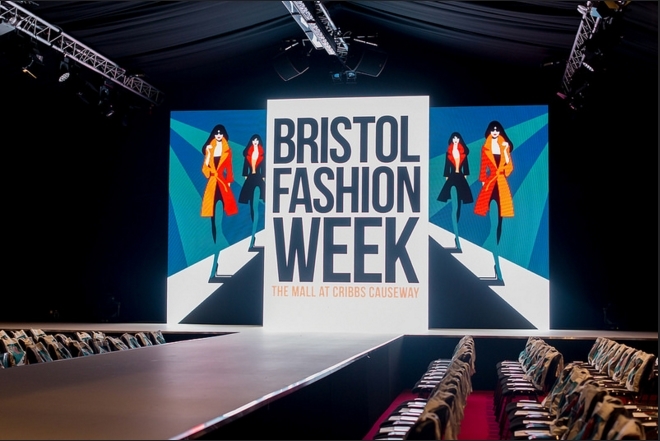 Bristol Fashion Week is always held at The Mall in Cribbs Causeway and this season was hosted by Denise Van Outen and Mark Heyes. Before the event I had to go get my ticket, where the lady asked me "Are you a blogger or press?". 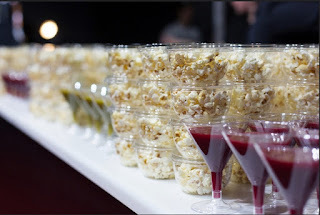 This surprised me as this was my first proper blogger event and I just assumed I was going to get a ticket like anyone else. However, my name was on a list and I was given a pass that said "Blogging Pass" on it. It felt weird having a pass for an event! On entrance inside the Bristol Fashion Week tent you are greeted by areas in the tent where you are given free mocktails and popcorn which I thought was a nice touch. I had no idea what mocktail I drank, but it was lovely nevertheless. I was nervous about going because I had never been to Bristol Fashion Week before. I was quickly introduced to someone who had also never been to Bristol Fashion Week before so we got to hang out together which made me feel less nervous as I wasn't the only new person there. There were lots of beautiful bloggers around with such lovely outfits on and it was intriguing to see different styles. Denise Van Outen wore a vibrant red Ted Baker dress whilst Mark was looking smart in a suit. Topshop and Topman showed us 'Suited & Booted' fashion for the colder weather. Their clothing was formal and I noted that they were wearing grey coats. The co-host Mark Heyes suggested that formal flared trousers could be worn with wedges. 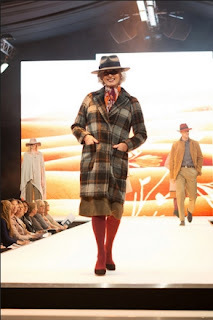 Similarly, Marks and Spencer went for the colour grey with 'Nomadic' fashion with layers and winter hats for both males and females. Burgundy also seemed to be a statement colour and the women noticeably wore beautiful suede skirts. Mark touched on the suede skirts by explaining that they are a 'statement skirt' and that other statement skirts would be in fashion this season. Animal and Timberland then showed us the ladies wearing checked shirts, which has definitely been seen for a long while now in fashion. I've seen these everywhere for both males and females and can be worn as a shirt or open as a light jacket. 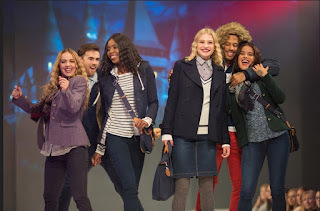 They also paired the models with backpacks which have also been around a lot this year. It seems that there are a lot more backpacks in the shops now and even being favoured over the handbag. Likewise to the others, Oasis and River Island presented the colour grey a lot. Additionally, they had taken on the idea of patterned clothing for the females but in the form of dresses. What seemed interesting to me was that not only did they wear dresses but they were also wearing basic long sleeved shirts underneath, with the collar and arms being visible. This would be ideal for the colder weather as it means not only can you look stylish in a dress but can also keep warm with a top underneath. This can help you transition your dresses from the warmer months to the colder months. They also showed long trouser dungarees which surprised me. This summer has been full of dungarees and it seems dungarees won't be fading away any time soon with ones being on the market for Autumn. As part of Bristol Fashion Week, a member of the public is chosen to undergo a complete makeover and then get to walk the catwalk. Her hair was crimped, matching the other models, which tells me that crimped hair might become favoured. Her outfit was styled by Jigsaw and she wore navy blue suede boots. These are a statement boot and supports suede becoming popular. 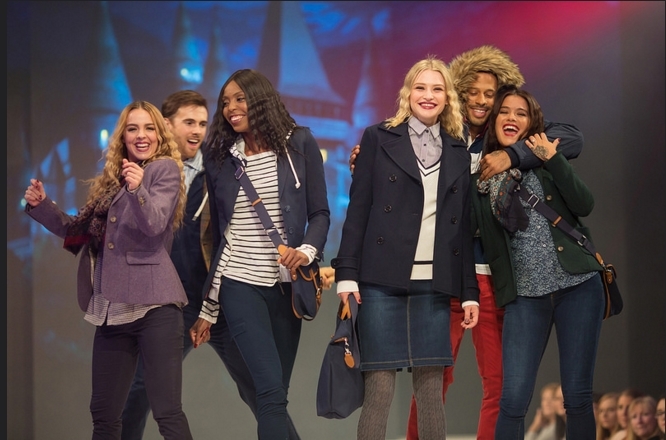 New Look and River Island then came together to show us how we can style bright and bold colours such as blue and red. The ladies wore bold coloured tights different to your usual black tights, along with bold coloured trousers which also suited the men. There was also a faux fur coat from Hobbs which we always see in fashion in Autumn/Winter as faux fur become desirable when you just want to feel warm and cosy. For the seventh scene, Phase Eight and Austin Reed also promoted wearing patterned dresses with tops underneath. There were also a lot of fringing, including suede fringing, which is inspired by Burberry. There was also a fringed jumpsuit, another way in which you can transition the styles from the warmer months to the colder ones. Crew Clothing, Gap Kids and Clark's Shoes then showed us bold colours again, this time in the form of red jeans on the males. The females wore denim skirts and cosy jumpers. In my favourite scene, John Lewis did the 'Leading Lady', with fabulous trench coats, fur collars/hats and long-to-knee coats. 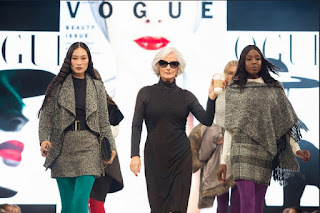 They certainly showed us how we can stay warm and cosy whilst still looking fabulous. Lastly, in my second favourite scene, Marks & Spencer did a 'Noir' scene with lots of sequins, black and sparkly biker jackets. I think the sparkly biker jackets are fantastic as it incorporates a statement in the alternative, rocker scene whilst making it sparkly and fantastic for a night out. 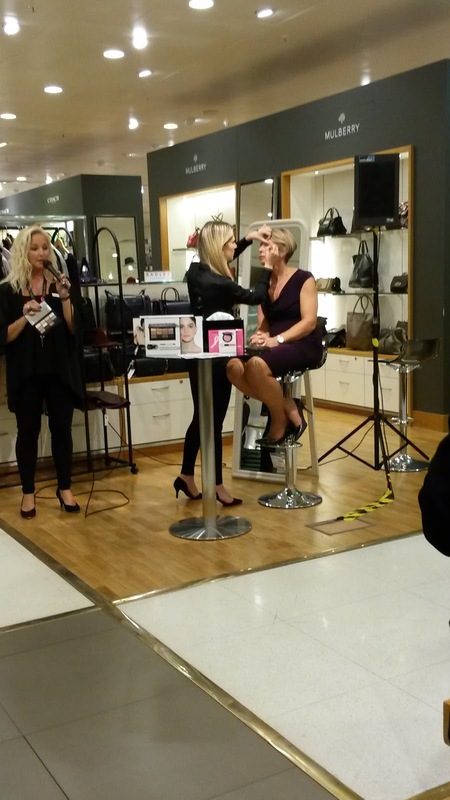 After the show, we were invited to two events in The Mall in John Lewis and Crew Clothing Co (a new addition to The Mall). First we went to John Lewis where we were greeted by a charming man in suit who gave us champagne. We then watched a demonstration of someone trying on different outfits from John Lewis and explaining to us how we can pair different items of clothing. 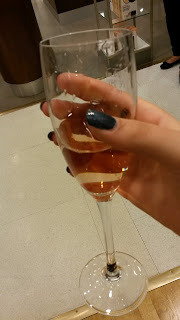 Then, we went to Crew Clothing Co where we got to have a look around at their range with a free glass of prosecco. 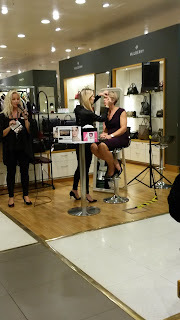 To finish off, we went back to John Lewis because they were doing a Bobbi Brown demonstration. I didn't get to see it all but I had never seen Bobbi Brown products up close before so it was interesting to see. After the show we were also given goody bags in a Bristol Fashion week canvas tote bag (which I now use for shopping). The goody bag included various vouchers and hair/body products from brands like Neutrogena and Schwarzkopf. Overall I really enjoyed Bristol Fashion Week. I nearly didn't go because I was nervous about being on my own but I made some lovely friends and I loved watching the show. I would definitely like to go to the next show and I am so glad I looked past my nerves. 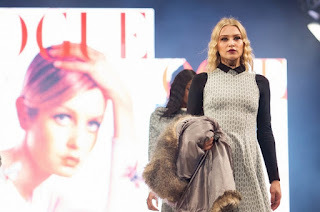 Credit for the wonderful photography goes to Charlotte Stone and The Mall at Cribbs Causeway. The only photos I had taken myself were of the after events and the blogging pass. Did you go to Bristol Fashion Week? Let me know! If you've been here a while then you would know that I really like my green corrector concealers. For anyone who doesn't know, using a green concealer on your face underneath your foundation/concealer neutralises redness. This can be used on red skin, blemishes and acne. As someone who has a lot of redness from scarring, this is perfect for me and I NEVER apply my make up without using a green concealer! And no, it doesn't make your make up have a green tinge. 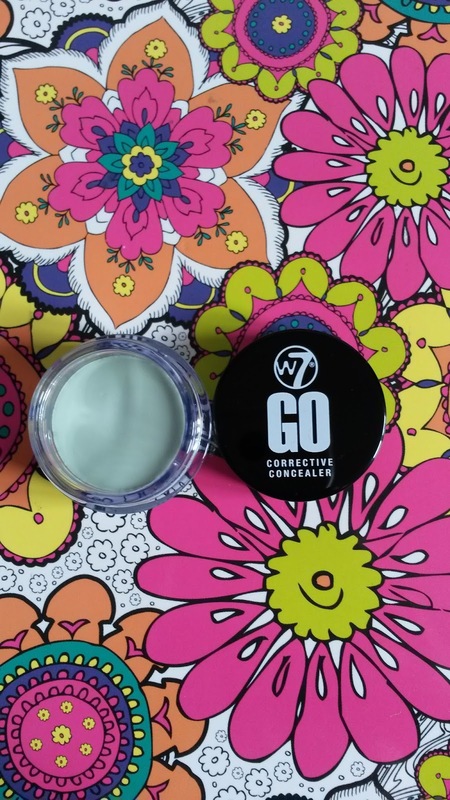 This is the W7 Go Colour Corrective Concealer. I haven't used W7 make up before but have used a couple of nail polishes by them. I've seen W7 be used by bloggers and YouTubers but I haven't seen W7 being sold in anywhere around me. However, when my Mum went to Scotland she spotted W7 there and decided to buy this for me to try. The concealer does what it says on the pot. It covers well and does neutralise redness. Because it is in a pot you have to either use a brush to apply the product or use your fingers which I am not used to. I normally use concealer sticks that I apply straight onto my face. But anyway, for this I used an angled eye brush to apply it as I thought it would be more hygienic than using my fingers! I like using an angled brush as it means I can apply it to a more specific area and also get into small areas like the sides of my nose better. There are pros and cons to it being in a pot. A positive is that because I use a brush I can apply it to specific areas which would be good if you only want to apply it to a few spots or really small areas. Despite this, a negative is that it means it takes longer to apply than using a corrector stick like I normally do. Due to the fact I like to put green on most of my face in large areas, it would make more sense for me to use a corrector stick as it will cover the larger areas quicker. However, I do like it for the sides of my nose and around my eyes. If you want to go for smaller areas I think this would be better for you. But overall it does the job it intends to do and it is not a bad product. You can buy it for £4.95 for 7g. It isn't as cheap as my Natural Collection Green Stick Concealer at £1.99 but I don't know which you get more product in as I can't find how much product there is in the Natural Collection One. If I ever see this around I might buy it again and as I said above, I would recommend it to people who only want to apply on a small area at a time. Do you use any coloured corrector sticks to neutralise certain colours in your face? Let me know! 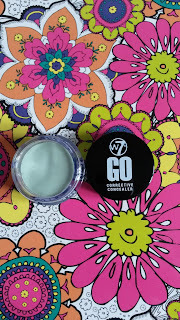 Also, feel free to check out my review of the Natural Collection Green Corrector Stick (click here) and the Max Factor Colour Correcting Green Stick (click here). My last post was back in April when I started the Mango Body Scrub (click here). Since then I did finish it a while ago. However, I also had a small sized version of the same scrub which I started afterwards but I didn't see the point in telling you guys about it when it was the same one! Anyway, I've just finished the small sized version and I'm on to a new one. 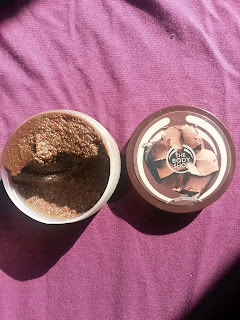 This is The Body Shop Chocomania Body Scrub. Yes, you've guessed it- it smells like chocolate! I don't like it as much as the Mango one but it is still the lovely texture as all The Body Shop body scrubs are and the smell of chocolate lingers on your skin. It looks like chocolate too which is a bonus! Almost good enough to eat. As you can see this is only a small tub of it so I am sure it won't be too long until you see 'My Current Scrub #5'! What is your ultimate body scrub? Let me know!